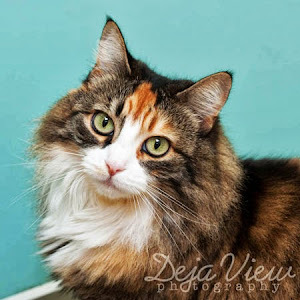 Marvin was adopted the last week in April. 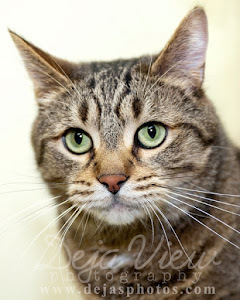 Meet Marvin, a new cat at HSJC! 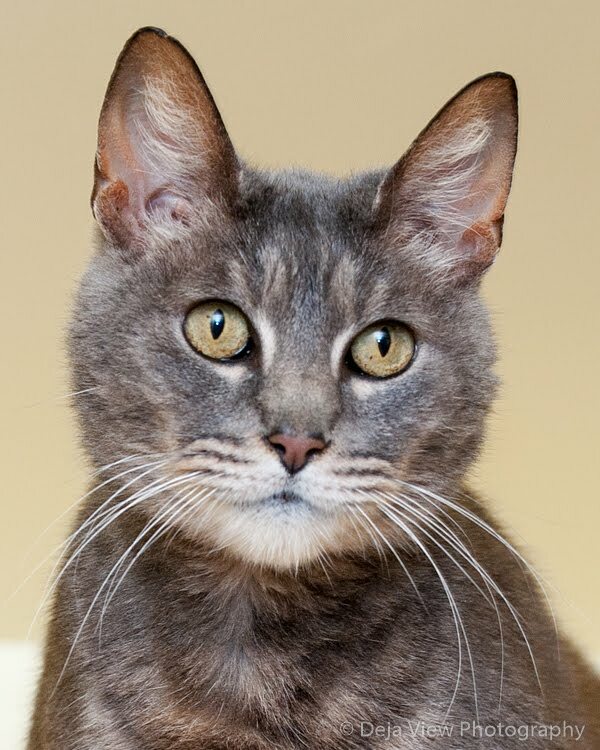 Marvin was brought in by animal control, after allegedly being abandoned by his former owner. 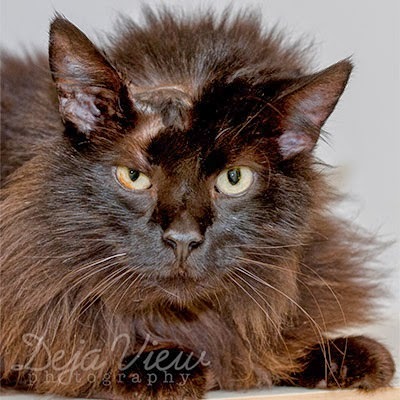 Poor Marvin was in poor shape when he arrived in late March, and is still recovering. He came in with a rather large abscess on the right side of his forehead. It was so swollen it was pushing his eye closed. Marvin immediately went to the vet. Thanks to Hadlock Vet Clinic, and the efforts of our volunteers doing warm compresses on sweet Marvin's noggin, he is doing much better. Marvin is a very affectionate cat, and we're all enjoying caring for him here. He only has three legs (is missing a rear leg), so will need an indoor only home when he's ready for adoption. 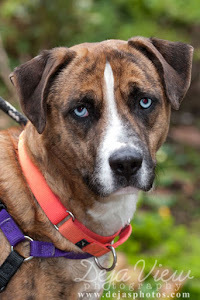 We're hoping he'll be well enough to find his forever home very soon! 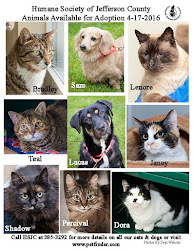 You can visit the shelter Tuesday-Sunday from 12-5 or call them at (360) 385-3292. In front of the camera for a change. 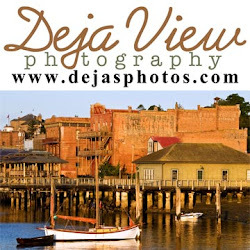 Deja View Photography is located in Port Townsend, Washington. 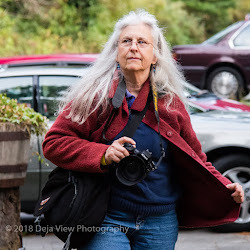 I specialize in portrait and event photography including photographing weddings in Port Townsend plus anniversary or birthday party coverage, bar or bat mitzvah and Quinceanera celebrations. 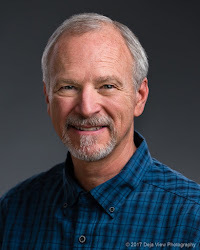 My Port Townsend studio lighting is setup to create flattering images the professional may need for an updated head shots for their website or printed material. Each year I photograph local Chimacum and Port Townsend High School Seniors wanting unique images for their yearbook. 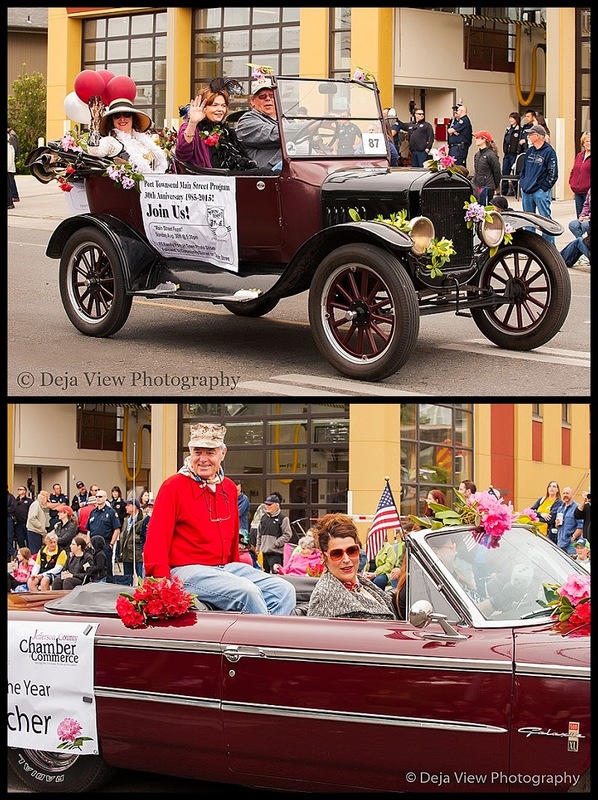 There are so many unique venues here from from Chetzemoka Park, beautiful Fort Worden State Park or historical downtown where the Northwest Maritime Center is located. 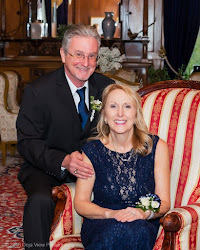 I have photographed weddings at the Northwest Maritime Center, American Legion, Elks Club, St Mary's Star of the Sea Catholic Church, First Presbyterian Church, Manresa Castle, the Farm Kitchen in Poulsbo and Fort Worden. 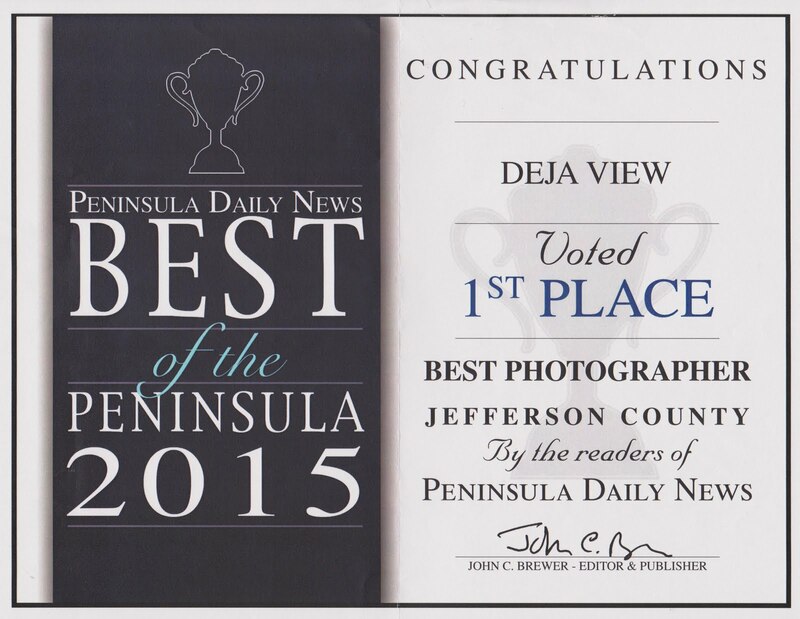 You can reach me at Deja View Photography (360)385-2662. 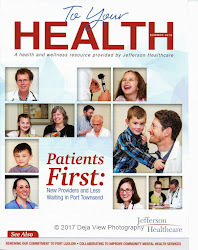 This year I had the opportunity to photograph several events for Jefferson Healthcare. I photographed a JHC Foundation fundraiser in February, their ribbon cutting ceremony for the new wing of the hospital, plus several publicity pieces they did during the year. This is my second year to photograph new employees needing professional head shots including the new Doctors staffing in the new Orthopedic wing. 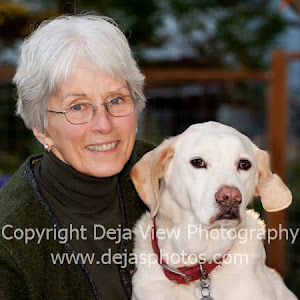 I love photographing professional head shots and in addition to hospital employees I also photographed several local authors, Port Townsend Real Estate agents and business owners. ﻿Young Vance and his brother Bo braved the cool temperatures and winds to have their photography session out at Fort Worden this week. 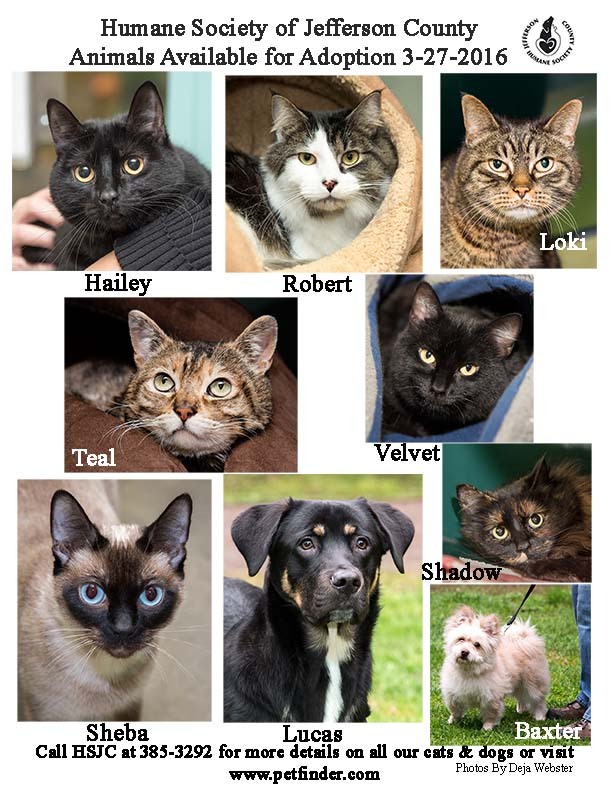 Roxie and Shadow have been adopted. 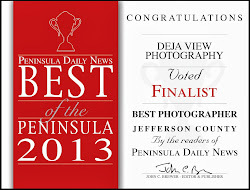 Visit my website to read some of the reviews clients have written about working with Deja View Photography. 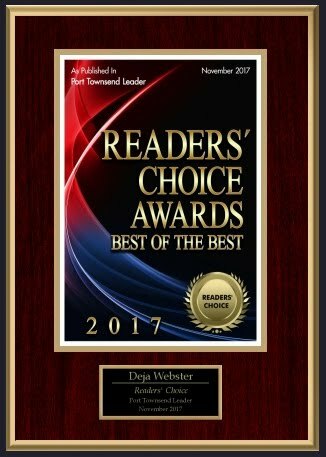 Thank you to all who voted for me. 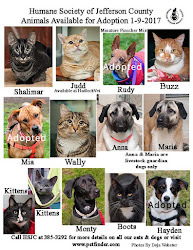 3-27 Adoption Poster. 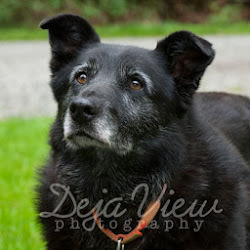 3-30 Sheba was adopted. What Is It All About Alfie? 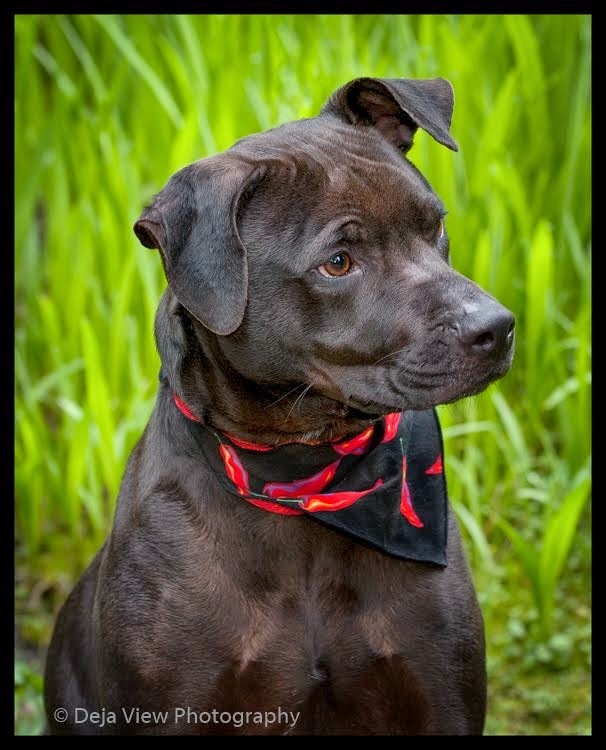 This handsome Boxer/Lab Retriever mix named Oakley is seeking a new home. He has the most beautiful shiny coat with a lovely combination of browns and black. 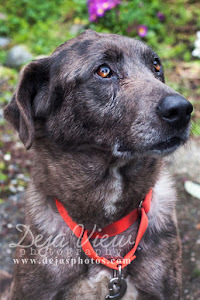 He is a sweet guy and would make a great companion. It just takes one person to make a difference in this deserving dogs life. 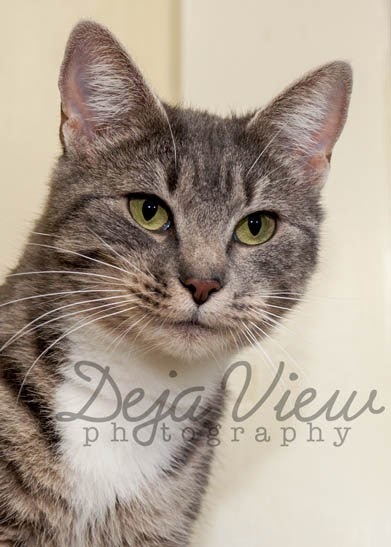 You can visit him at the Jefferson County Humane Society Tuesday-Sunday or call them at 385-3292. 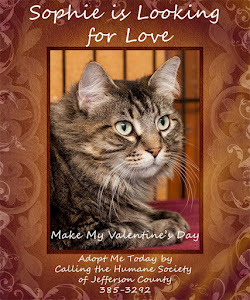 Please considering sharing his photo, it just takes one person to see him and want to take him home. 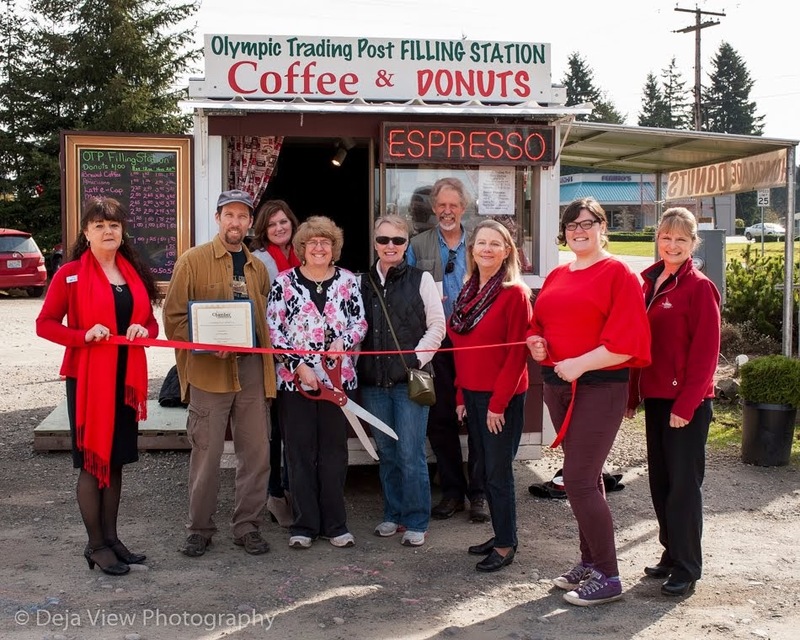 A photo I took last week at the official ribbon cutting ceremony for the Olympic Trading Post Filling Station in Port Hadlock. Thanks Dallas for writing this great recommendation. The Senior images Dallas is referring to are posted here on my Blog on February 9th. Deja Webster was terrific to work with. I called her 12 hours before I had to submit senior photos to the school, and she took charge immediately booking the studio photos for that evening, editing them while we were there, and then submitting them directly to the school. Then, when we had a little more time, Deja took outdoor photos which turned out beautifully. I highly recommend her work. 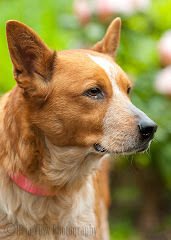 6-11 Sadie was adopted this morning. Lex Found A Home. Yahoo!! Deja, you were amazing. All our wedding pictures turned out even better than I could have imagined! You caught so many special, little moments that if not photographed would have been lost in the shuffle of the day. We just were looking through our... wedding album last night and you captured photos of so many of our family and friends that will now be cherished forever. Every photo had a unique style that just wouldnt be there if we had hired anyone else. You went above and beyond for us, everything from being there for our rehearsal to helping us put together the picture frame that holds the whole story of the day. We were so blessed to have you photograph our wedding, we will definitely recommend you to anyone with an upcoming wedding or event, anyone who has children they want photos of and we will definitely be back with our little family someday! 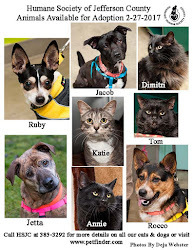 The perfect family adopted Sophie from the shelter today. Thanks again Judy and Mac for your kind words. 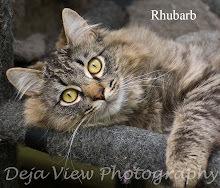 When our sweet Rita had to be put to sleep a few months ago we went back to the wonderful picture memories Deja took for us when Rita was young. I can't say how much we appreciated Deja's digging through her archives to resurrect some of these for us so we could put together a memorial for a beloved pet that brought us so much joy and laughter over the ten years we had her. Thanks Deja! 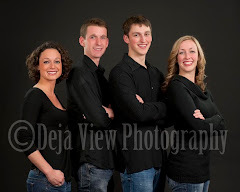 Thanks Judy and Mac for your comments on booking a family session with Deja View Photography. When our family was all here for a birthday celebration last year we wanted to take the opportunity of having all of us together to take family pictures. There were 10 of us plus two dogs and we not only wanted a photo of all of us together but several photos of different combinations of people and dogs. Deja made it easy! She came to the house before everyone arrived to be sure that the time of day we had scheduled was right for light as we were hoping to take some inside and some outside. 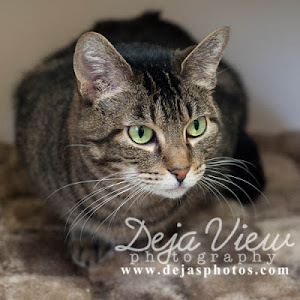 We were impressed with how Deja worked well with everyone (from ages 9 to 70 plus two canines)! Everyone had a good time and the pictures turned out great! Joyce Finch sent me a lovely thank you card in reference to her daughter's Senior Session. Thank you Deja for taking such amazing senior portraits of Leah! You seemed to capture her beautiful spirit as well as her appearance. I will not be doing the Farmer's Market this Saturday. I will be home editing photographs from recent portrait sessions I done. If you have missed me at the Market and are interested in getting some cards or setting up a session please give me a call at 385-2662. I still plan on doing a couple more Markets before the last one in December if the weather holds. I will be at the Port Townsend Arts Guild Show at the PT Community Center November 26 and 27th. I should have several new products on display at that show. Hope to see you there. I had the best BLT tonight with a tomato from Old Tarboo Farm. Wow what an amazing couple weeks I have had. 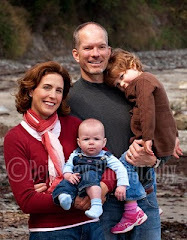 I have photographed 2 family reunions, 1 birthday party, a studio session, 1 handsome dog and 2 families at the beach. I have been so busy taking and editing photos I haven't had time to add images on my Blog but hope to catch up this coming week. 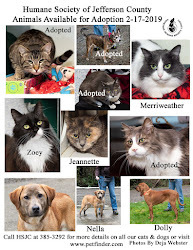 Hope to see everyone at the Port Townsend Market next Saturday. I won't be at the market again this week as I'm attending the funeral of a dear friend Alice Hinkley on Saturday. Alice was 94 when she died last week. We volunteered together years ago at Kah Tai Care Center. Not long after Alice lost her husband Ottis she joined the grief support group, Tuesday Social Club, I started 7 1/2 years ago. Poor health made it difficult for her to attend the group the last couple years and we all missed seeing her. Alice and I both grew up in Wisconsin so I had a great appreciation for the comfort food she brought to our Tuesday Social Club potlucks. She always had a tasty hotdish like the food I grew up on. She also made the best assortment of cookies and shared them with all of us at our yearly Christmas party. Alice always called me Kiddo whenever I talked to her and was always upbeat and had a smile to share. I know she will be missed by all her friends and family. I'm sorry to miss two Saturday Farmer's Markets but I'm excited to be photographing two family reunions and one birthday party. If you need to contact me before the market on the 21st just give me a call at 385-2662. Stop by the Farmer's Market to look at all my latest cards and prints or to sign up for a portrait session. This will be my last market for a couple weeks as I have several family reunions I will be photographing the next two Saturdays. 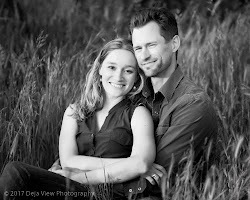 If you miss me at the market just give me a call at (360) 385-2662 to schedule your portrait session. 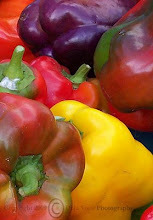 Wow the sun is out, really out, so this week should be another beautiful Saturday at the Farmer's Market in Uptown Port Townsend. I have lots of new cards and prints for sale and I'll have my calendar in hand if you want to set up an appointment for a portrait session. Another Saturday Farmer's Market is here. Looks like a good chance of showers off and on today but this is the Pacific Northwest and it's November, no June. I'm packed up and ready to head out to the market this morning. Can't wait to see my regular customers that stop by my vendor's booth every Saturday. I have my calendar in hand so if you want to stop by and set up an appointment for a portrait session we can do that. 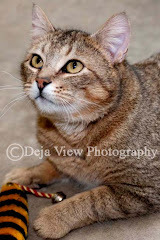 Stop by Deja View Photography at the Farmer's Market today and visit. What a wonderful time we all had at the Port Townsend Farmer's Market last week, no wind, no rain and lots of customers. I sold several of my mini-books on Port Townsend and lots of cards. 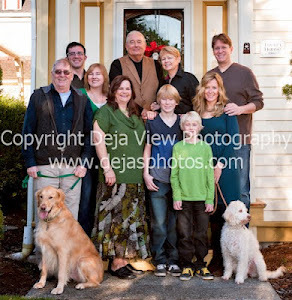 I visited with several prospective clients who were interested in having their family reunions photographed. I also spoke to several people about my Father's Day special good until June 20th. 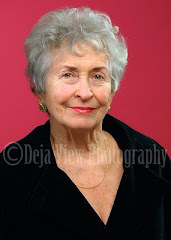 I'm offering an in studio photo session and a gift 5x7 print for $50 which is over a $50 savings. Give me a call today to set up an appointment. 360 385-2662. 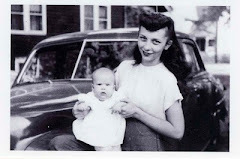 This is one of my favorite photos of my Mom. 2010 CD Calendar. Order One Today. I'm really excited about this new product, a cd calendar. I had them for sale at the Art Show last weekend and have sold 25. 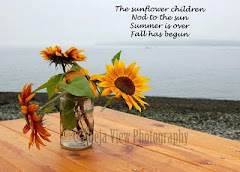 It is a series of 12 colorful Port Townsend images that fold into and are displayed in a cd case. It is the size of a regular jeweled cd case nearly 6 inches tall and almost 5 inches wide. The calendar makes a perfect holiday gift and is just the right size for viewing on a desk but doesn't take up too much space. You simply change the photo each month, the quality of the print is so lovely you might even slip the image into a small frame. I will have these for sale at the PT Farmer's Market on Saturday, December 5. 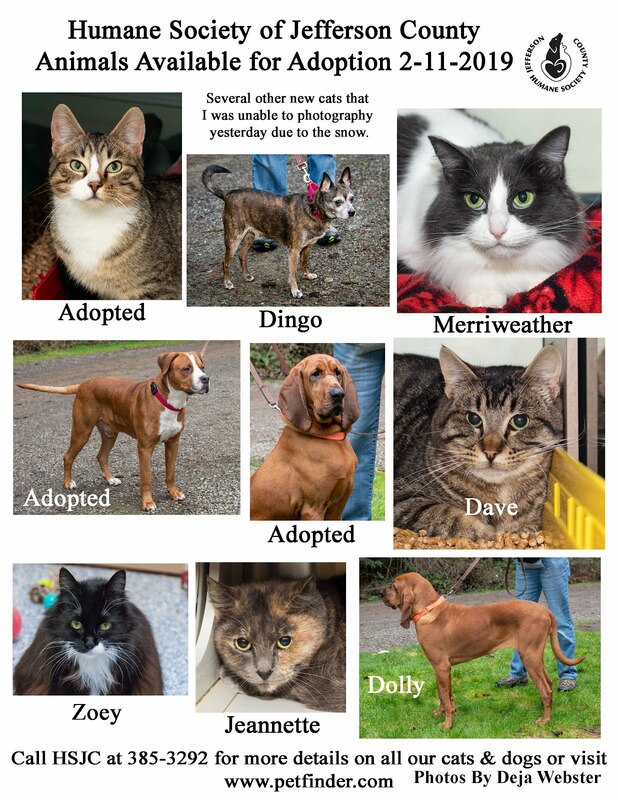 The cost is $19.95 and if you are interesting in ordering one and you live outside of Port Townsend I can mail one to you for an additional $3.50. Just give me a call at 385-2662 if you are interested in ordering one in time for the holidays. If you have missed me at the PT Farmer's Market you can find me at the Holiday Art & Crafts Show Friday and Saturday after Thanksgiving. 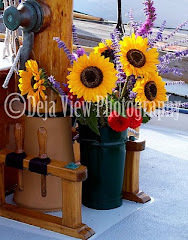 I'll have new cards from photos I took during the Wooden Boat Festival and several canvas prints. 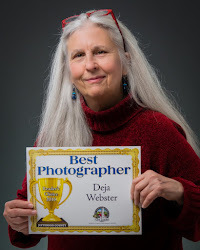 If you need a special gift for the holidays a gift certificate for a portrait session from Deja View might be just perfect for a family member or friend. Look forward to seeing all my regular clients during this two day show. If you want to contact me before hand to make sure I have a specific card, pack of cards or a print, just give me a call at 385-2662. I'm actually taking a couple weeks off from the Farmer's Market to meet with clients in my studio and to work on editing photos. I will create a posting here just before I attend the next Saturday market so check here for updates. Give me a call at 385-2662 if you want to purchase any cards or prints or set up an appointment. I will not be a vendor at the Saturday Farmer's Market this week. I'm at home working on editing lots of photos from recent portrait sessions for my clients and painting my new portrait studio. I have a 700 sq. foot portrait studio next to my home but have just expanded my space to include an additional 700 sq. feet for a viewing studio for my clients. I'm making space available for my clients to come to the viewing studio before the actual session to talk about the session and to view examples of my work. Not only will the finished photos be available on line but clients can return to the studio to view them, see different sized prints and canvas to help them with their final purchase. I hope to have the upstairs studio up and running by the first week in October. 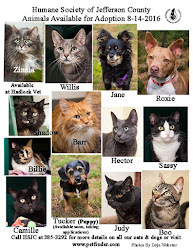 It is not too early to start thinking about a family portrait as a gift for family this holiday season. Give me a call (385-2662) to set up an appointment. I currently have some several open slots for a portrait session the last week in September. I have not been at the PT Farmer's Market the last couple weeks. I did a wedding on August 22 and after that I went to Wisconsin to visit my family for a week. So I will return this week at the market which being held in its usual location uptown while the Wooden Boat Festival and Artist Guild's Craft Show is being held downtown. My booth will be located near Pane D'Amore Bakery. I have fallen a bit behind in my postings. I have taken a couple days off to visit my family. I will be back at the Market on Saturday the 5th and have studio time available for the week of Setember 7th. 7-17 I had a wonderful day at the Farmer's Market today. Port Townsend and the market had lots of visitors here probably due in part to the Lavender Festival being held this weekend in Sequim, WA. The wind came up early this afternoon and many of us vendors were holding down our tents with one hand and making change with the other. I actually packed up several of my framed photographs a bit early just to prevent the possibility of breakage due to the wind gusts. I sold lots of note cards today especially those with dogs on them. My best seller is a image of a lab wearing Doggles (goggles) sitting in the back of a steel blue pick-up truck. It was a photograph I took a couple years ago when I spotted the dog in a truck in the parking lot of a Barnes and Noble in Redmond. The owner eventually came out and claimed the dog loved to wear the googles, they wouldn't last 2 seconds on either of my dogs. I'll be back again next week as a vendor at the market. Stop by and see what new cards and prints I'll have avaliable. I have several spaces available the week of July 20th if you are interested in a portrait session in my studio. Give me a call at 385-2662 to set up an appointment. 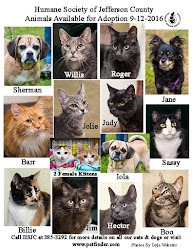 Visit Me at the Port Townsend Farmer's Market on 7-18-2009. Happy 4th of July everyone. 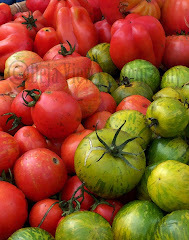 I will be a the Port Townsend Farmer's Market again on Saturday, July 4th. The market runs from 9:30 to 1:30 and my vendor's booth this week is located on the same side as the Printery and close to the corner where Bad Habit is on Lawrence Street. I have some new prints and cards for sale along with several framed pieces. I'll have my calendar with me if you want to set up a date for a portrait session. Right now I have some spaces available the week of July 13th. If you missed me last week at the PTFM I will be there as a vendor on Saturday, June 27. I'll be at the Port Townsend Farmer's Market on Saturday. Stop by my vendor's booth and see my cards and prints along with my first 16x20 canvas print. I'm very excited about offering this new medium to my clients. The quality of this photograph actually printed on a canvas, stretched and ready to hang on a wall is very impressive. The image is of a young man I photographed recently in my studio. I plan to offer this type of print to my portrait clients who are interested in larger images along with printing several of my popular Port Townsend scenes on canvas. My home studio is up and running and available for photographing individual and small group photos. Give me a call at (360) 385-2662 to set up an appointment. I have some opening the week of June 14th. It is not too late to have a portrait taken to surprise Dad with on Father's Day. 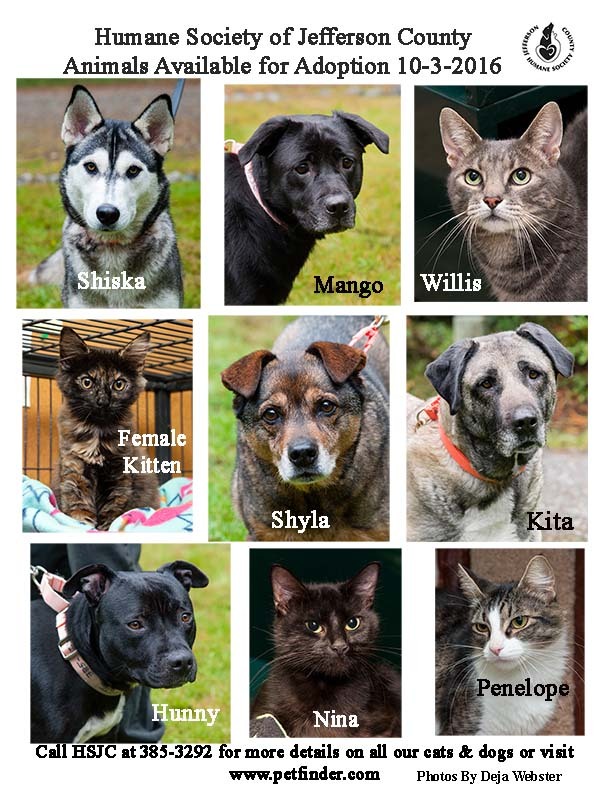 Looking for Companionship in Port Townsend?